Whipping up a transatlantic trade agreement? Shop wisely. The EU and US negotiators of the Transatlantic Trade and Investment Partnership (TTIP) meet in New York this week for the 13th round of negotiations. In the media storm that accompanies TTIP it is not easy to keep a bird’s-eye view. 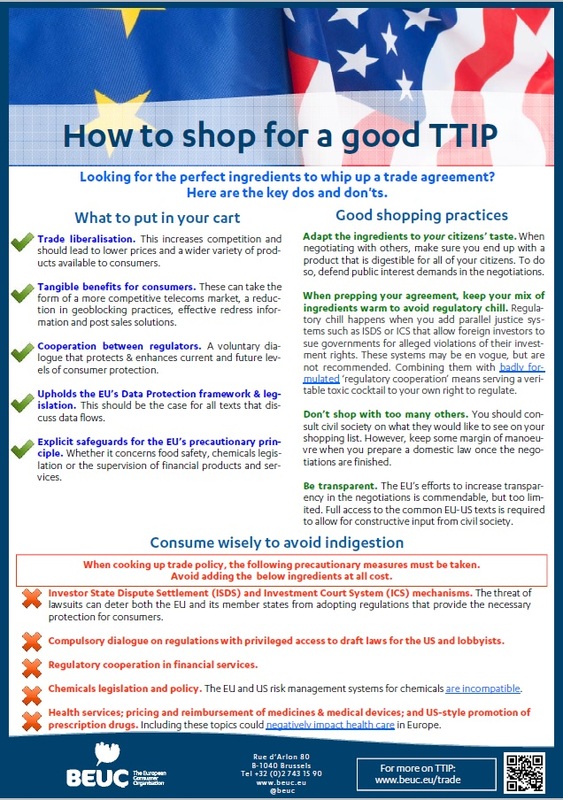 We have therefore prepared this shopping list, reminding negotiators and other stakeholders about the consumer movement’s key concerns regarding the negotiations. Why a shopping list? Because TTIP is a vast undertaking, with the final agreement expected to have 24 chapters. It is vital that the European Union makes the right choices in formulating these chapters with its American counterparts. Indeed, choice as such is positive – and as representatives of the consumer movement we support it. But amidst choice one must shop wisely (and be able to do so). Here are our key dos and don’ts [pdf]. Chaos and disorder in copyright law – happy #WorldIPDay!